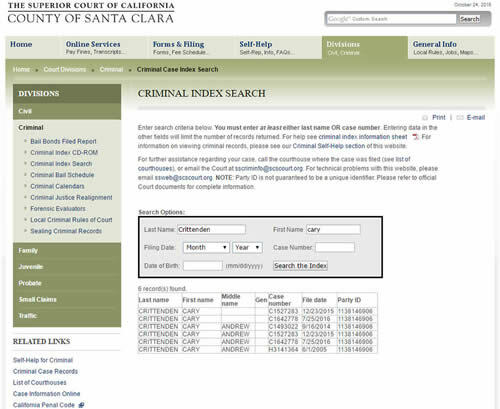 What is Santa Clara County Court Prosecutor Barbara Ann Cathcart trying to Hide from the Public? Is the victim Cary-Andrew Crittenden now being extorted or blackmailed by the court to shut him up? Is he being threatened with a gag order as to stop him from exposing the very court and county which caused him to speak out? 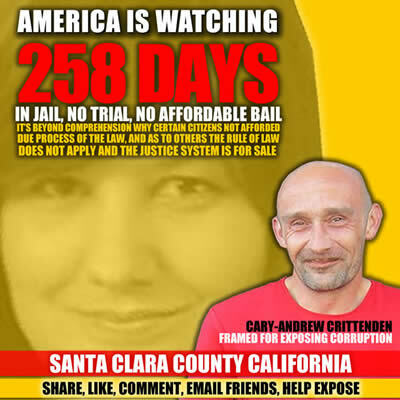 We’ve been following the Cary-Andrew Crittenden false arrest from the beginning. I want it understood very clearly. As a citizen of the United States of America I have the absolute right to not only discuss, but to comment on any trial or other political or content related matter without interference from any Court lacking jurisdiction over me. While Mr. C has not been in touch with me, based upon my reading to the First Amendment and the Constitution of the United States of America he has an absolute right to do so. I practiced law for more than fifty years and therefore to deny him access to an expert or ignoramus to consult is a denial of EQUAL PROTECTION OF THE LAW per se. Bribing a judge, a politician, or a public official today does not start and end with handing the corrupt establishment political figure with a white envelope filled with cash. Today it is much more subtle – and it has been more subtle for many years. Chicago has a history of corrupt election process and the tampering with the elections. It is almost ludicrous to hear the hue and cry that was raised when Mr. Trump called attention to this FACT. I understand the CBS news is advertising that they are this week doing a story on how Chicago’s dead citizens still vote. All the foregoing is interesting and disgusting in the grosses sense. Vote fraud, no matter whether or not the Establishment political souls acknowledge it or not is a reality and seriously endangers our electoral process. The cancer is one of the proximate causes of ELDER CLEANSING and a danger to not only the elderly and the disabled but every one of us. However, Today’s Wall Street Journal and other media outlets reveal a unspeakable crime that crosses the red line. Above video is San Jose Police Department response to an assault with deadly weapon incident at Markham Plaza Apartments in San Jose. The weapon was large butcher knife. This was part of a pattern of incidents at Markham Plaza which included another incident where a person was actually stabbed. Robert Ridgeway was responsible for security & maintaining cameras. The residents turned to me for help because staff was unresponsive to residents concerns about these safety issues. Detective David Carroll called me several times on the phone and threatened me that I would be arrested if I brought these matters to the attention of US dept. of Housing and Urban development & forbade me to not bring attention to this on the internet. After judge Peter Socrates Manoukian got involved, the crisis at Markham Plaza escalated dramatically into an emergency situation and one of the residents, Robert Moss was found dead almost immediately after the fraud in case 1-12-CV226958 They threatened to arrest me for trying to get him groceries and they claimed that the Cathedral of faith church in San Jose was a terrorist organization because they offered the residents access to job coaching / resume writing workshop. In attempt to keep out the news media, they accused Dan Noyes of ABC News of threatening to kill one of the residents and this is stated ON THE COURT RECORD to 1-12-CV226958. Just to give you some background & hope you can understand my frustration. Santa Clara County Sheriff detective David Carroll, Sergeant Samy Tarazi and assistant DA Barbara Cathcart are recklessly endangering Heidi Yauman and also the residents of this apartment complex. My job as tenant rights activist is to address these health & safety concerns and keep the public safe. trying to kill another resident.. This is the SECOND TIME in months that Ms. Cano had done this. resided there. This was a retaliatory act strictly prohibited by FEHA. can be confirmed by contacting Hon. Judge Weisblott. with frivolous whistleblower complaint against Larry Kubo. prohibited me from contacting Orry Korb or US Dept. of Urban Development. could not suppress evidence that did not exist'”. because she, as County Counsel oversaw the Larry Kubo’s role in the scandal. County Executive because Larry Kubo is a County Counsel attorney. involving Suppression of evidence and placing the residents in danger. CCO must retain for three years. dangerous if not more than these officers. wretched pain and suffering caused and the danger you are placing people in.